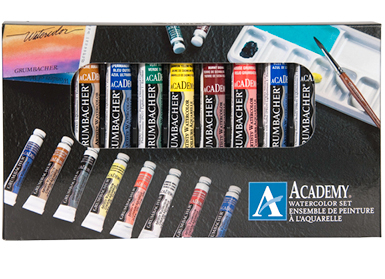 A great set for those exploring watercolor, this set has everything a beginner needs to make a watercolor painting. Set includes: watercolor paper, 1 mixing guide, 1 brush, 1 palette, 1 pencil, 1 kneaded eraser, and 5 7.5ml tubes of watercolor paint. Colors include: Burnt Umber, Ultramarine Blue, Thalo® Blue, Thalo® Crimson, and Cadmium Yellow Pale Hue. 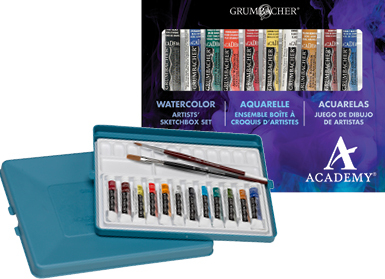 An excellent value for collegiate painters, this set includes one assorted-hair brush and a plastic mixing tray. 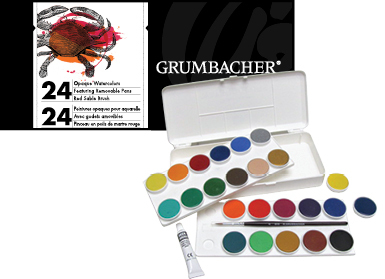 Ten colors in .25 oz (7.5 ml) tubes, include: Grumbacher® red, alizarin crimson, burnt sienna, yellow ochre, cadmium yellow pale hue, Thalo® green, cobalt blue hue, ivory black and Chinese white. Paints made in the USA. Ideal for plein air painters, this set includes twelve .25 oz. tubes of Academy watercolors, a round brush, a flat wash brush, and a palette, packed in a handy portable carrying case. Colors include: alizarin crimson, burnt sienna, cadmium red light hue, cadmium yellow deep hue, cadmium yellow pale, Chinese white, Payne' s gray, sap green, Thalo® blue, ultramarine blue, viridian and yellow ochre. Paints made in the USA. Ideal for plein air painters, this set includes twelve .25 oz. tubes of Academy watercolors, a round brush, a flat wash brush, and a palette, packed in a handy portable carrying case. Colors include: alizarin crimson, burnt sienna, cadmium red light hue, cadmium yellow deep hue, cadmium yellow pale, Chinese white, Payne’ s gray, sap green, Thalo® blue, ultramarine blue, viridian and yellow ochre. Paints made in the USA. 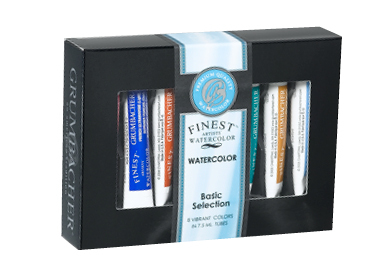 The Finest Watercolor Basic Set includes 8, 7.5ml tubes of premium, professional grade watercolor. Set colors include Alizarin Crimson, French Ultramarine, Burnt Sienna, Lemon Yellow, True Red, Viridian, Yellow Ochre and Cerulean. Made in the USA. Vibrant, luminous transparent watercolors are available in this 12 color pan set.These pans are removable and each set comes with a red sable round brush. Colors include:Yellow, Vermilion, Carmine, Violet, Ultramarine, Prussian Blue, Blue Green, Yellow Green, Yellow Ochre, Burnt Sienna, Raw Umber, Lamp Black. Vibrant, luminous transparent watercolors are available in this 24 color pan set.These pans are removable and each set comes with a red sable round brush. Colors include:Lemon, Yellow, Indian Yellow, Orange, Vermilion, Permanent Red, Carmine, Violet, Ultramarine, Cobalt Blue, Prussian Blue, Turquoise Blue, Blue Green, French Green, Yellow Green, Green Oxide of Chromium, Raw Umber, Vandyke Brown, Burnt Sienna, Indian Red, Yellow Ochre, Flesh Color, Payne's Gray, and Lamp Black. 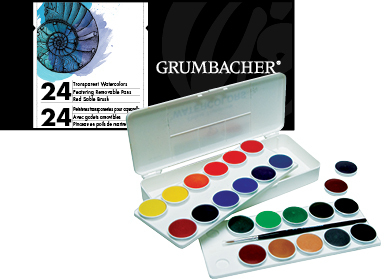 Vibrant, luminous transparent watercolors are available in this 24 color pan set.These pans are removable and each set comes with a red sable round brush. Colors include:Lemon, Yellow, Indian Yellow, Orange, Vermilion, Permanent Red, Carmine, Violet, Ultramarine, Cobalt Blue, Prussian Blue, Turquoise Blue, Blue Green, French Green, Yellow Green, Green Oxide of Chromium, Raw Umber, Vandyke Brown, Burnt Sienna, Indian Red, Yellow Ochre, Flesh Color, Payne’s Gray, and Lamp Black. 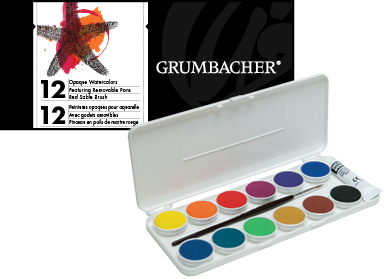 Bright, velvety opaque watercolors are available in this 12 color pan set. These pans are removable and each set comes with a red sable round brush. Colors include: Light Yellow, Light Orange, Light Red, Magenta, Violet, Ultramarine, Cyan Blue, Sea Green, Leaf Green, Yellow Ochre, Burnt Sienna, and Black. 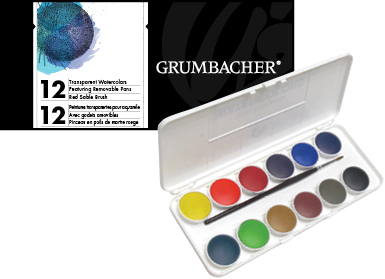 Bright, velvety opaque watercolors are available in this 24 color pan set. These pans are removable and each set comes with a red sable round brush. Colors include: Lemon Yellow, Light Yellow, Light Orange, Light Red, Deep Crimson, Magenta, Violet, Prussian Blue, Ultramarine, Cobalt Blue, Cyan, Turquoise, Sea Green, French Green, Leaf Green, Olive, Flesh Tone (fair skin), Yellow Ochre, Indian Yellow, Burnt Sienna, Umber, Gold, Silver, Black, 1 Tube Chinese White.